If you like downloading your movie trailers, you’re in big trouble. 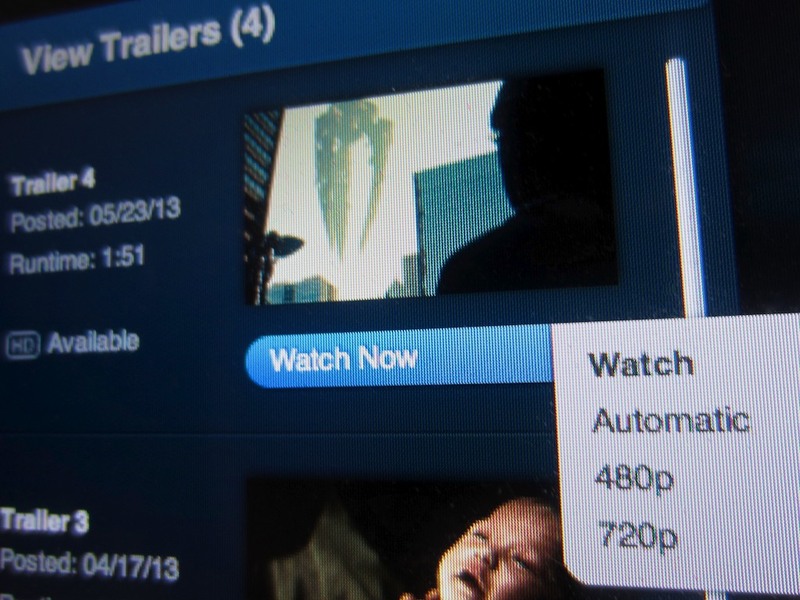 Apple is quietly removing this functionality from iTunes Movie Trailers. I really like movie trailers. A well-crafted movie trailer can capture the essence of a really great movie. I’ve got a little folder in my iMac with all my favorite movie trailers from the past few years. Plus, they live in smaller form in iTunes so I can watch them on my iPhone. Sometimes I just like watching my trove of trailers on the train during my daily commute as a Road Warrior. So yes, I like having my little collection of movie trailers, thank you very much. But I’ve paid nothing for the privilege. And once you download the trailer, you essentially own the file. I suspect there are a bunch of Hollywood folks out there intent on killing my joy, because they feel they’ve left some money on the table. And I wouldn’t be surprised if they’ve been having a few lunches with Apple lately. And it’s just a matter of time until Apple’s older downloadable inventory is erased from existence as the newer trailers replace them! It’s a slow, but sure downgrade. Before, you could download a trailer in glorious 1080p. And guess what? You can’t stream it in 1080p either! Because 720p is the largest streaming size Apple has ever served up. So you can kiss your entire 1080p movie trailer viewing experience goodbye. I’ve done the research, and I’m estimating there are about seventeen other people who seem to care about this dastardly secret I’ve uncovered. Everyone else can go happily about your life. Streaming your movie trailers might be fine as long as you have a strong Internet connection. Without one, you’re going to have to wait a while before watching anything! But if streaming is now the new norm for watching your trailers, you’d feel a bit better if you had the consolation prize to at least stream your movie trailers in 1080p. In an ever evolving 1080p/3D/4K world of more pixels, Apple has inexplicably ceded a leadership position and taken a step in the opposite direction, settling comfortably back to the ‘HD light’ flavor of 720p. I don’t really know why you’ve chosen to forsake the movie trailer lovers of the world. Yes, maybe you’ve been getting pressure from the movie moguls, but you’ve been quietly reacting without public comment. Please know that we’d really like the download option back, please. I can guess being in the movie trailer distribution business has probably not been a profitable venture for you. And Hollywood is probably giving you some pressure. So if this is about money… that’s okay. Please come up with some new ‘i-Service’ that includes the movie trailer downloads, and I’ll send over more money. Just, please… restore my little joy. What part of the media world wouldn’t want you controlling a piece of a movie (physically having it on your computer to do what you want with it) – probably the same one that foresees a future where we never physically own their content. Bummer as I enjoy the quicktime download trailer experience too. Going through and grabbing all the 1080’s while I can – download performance is horrible (funny, QT 7, Mac Lion, if open (8 closed) will be used instead of 8 and is much faster saving the movie to the HD). Once again…another example of Apple doing themselves in…its as though there are two companies…who are opposed to each other…ie how 1 side wanted to completely screw up FCP for some unknown gain vs. the other side who wanted to be a leader in video post-production. Same when they took away Sata connectivity via ExpressCard slot on the MBP. What is going on with them? Its as though they intentionally want us to leave our Macs!